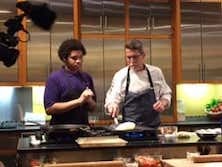 On Tuesday, March 20, three high school boys interested in the culinary arts received the opportunity of a lifetime: cooking alongside master chef, Rick Bayless, in the Frontera Grill test kitchen. The trip was excellently coordinated by ChiTech geography teacher, Shannon Haberkorn. The event was hosted by Big Green to encourage food literacy programs and connect kids in Chicago with real food. Haberkorn selected Osayi Omorgie, Grevelle Bladen, and Joel Russell to attend the special, educational outing because of their love for gardening, food, and, of course, eating. In addition to the three freshman boys, their mothers were allowed to join them on the excursion. 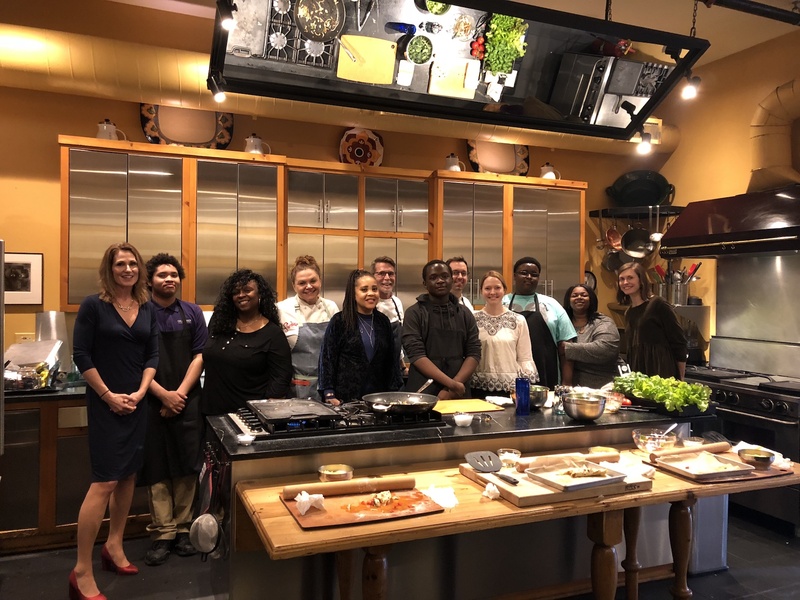 During the main portion of the trip, the three students prepared a delicious Mexican meal consisting of pico de gallo, flour tortillas, and onion and kale quesadillas alongside Rick Bayless and Sean O’Hara. All of the ingredients were locally sourced and provided by Gotham Greens. The boys were able to ask Bayless and O’Hara questions about what ‘real food’ means to them, what influences their craft, and what their favorite ingredients are. “The boys were nervous at first but once they started working in the kitchen they really opened up. They asked many extra questions of Rick and Sean and had nice conversation. Osayi especially had lots of questions for Rick and shared stories about his Nigerian family and food traditions,” said Haberkorn in response to how the students interacted with the chefs. 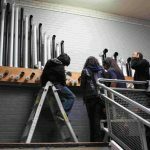 The opportunity for the excursion presented itself to Chicago Tech Academy through our relationship with Big Green. Big Green is a foundation that builds Learning Gardens for low-income schools to teach students about natural food and gardening. They provided ChiTech with its learning garden and continues to support our school with materials related to the garden. 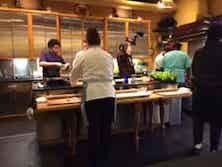 Through the experience, the students were able to learn about different career paths in the food industry by working with chefs and growers directly, learning where chefs can locally gather ingredients, and how they can actively involve their families in cooking and healthy meal planning. By working side-by-side with well known, professional chefs, the students received first-hand mentorship. In addition, they learned some basic knife skills and received many compliments from the chefs. To cap off the trip, everyone sat down to enjoy the fresh meal they had prepared. Haberkorn remarked that all of the boys tried new foods and enjoyed it immensely. When asked what she thought of the trip, Haberkorn said, “I am really proud of the boys for being so open to a new experience. I love that ChiTech gives students opportunities to try out real-world careers like the culinary field, and I’m grateful to Big Green for always providing us with unique opportunities”.